This play is an extended Abbot and Costello routine, a Second City sequence of skits, a Loony Tunes cartoon with Ralph Wolf and Wile E. Coyote as the Dromios. Some Shakespeare cynics dismiss this play as a shallow farce that only folk of common taste can delight in. The more devout Shakespeare scholars find thematic treasures in what they assure us is a true comedy, and they generally berate productions that rely on more funny stage business than Shakespeare's nuances. 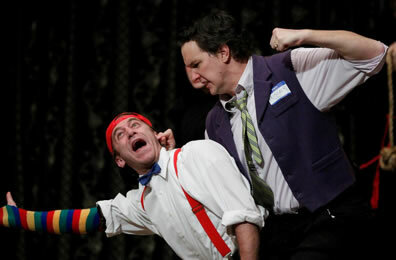 Tyler Moss as Dromio gets a beating from John Harrell's Antipholus in A Comedy of Errors at the Blackfriars Playhouse. The two actors engaged in a slow-motion sequence that highlighted this cartoonish production of the play. Photo by Tommy Thompson, American Shakespeare Center. Well, perhaps what we saw in this production: an Egeon (Benjamin Curns) in serious pathos speaking grand verse, an Adriana (Sarah Fallon) discoursing on matters of matrimony while trying to contain her jealous rages, and the rest all modern-dress slapstick. Come on, scholars! This play is an extended Abbot and Costello routine, a Second City sequence of skits, a Loony Tunes cartoon with Ralph Wolf and Wile E. Coyote as the Dromios. At times, the ASC troupe resembled cartoons. Gregory Jon Phelps as Dromio of Syracuse at one point popped his head out from his shoulders after a smackdown from Antipholus. In the gate scene, Antopholus' arm seemingly stretched 10 feet to grab Dromio's throat. Dr. Pinch (Jeremiah Davis), instead of being the zany manic of lore, was a stoic prelate (not at all as Antipholus later describes him), but when he called for help three Blutoish fiends in monksware stomped onto the stage to bind Antipholus and Dromio. Allison Glenzer, meanwhile, played Luce/Nell exactly as Dromio later describes her—complete with the greasy, sweat-soaked face—so that we couldn't help laughing every time Dromio mentions her. Glenzer also played the Abbess as a ruler-wielding nun who literally reveals herself as Emilia to Egeon like Jessica coming on to Roger Rabbit. The great tour de force moment in this production was the slow-motion beating of Dromio of Ephesus (Tyler Moss) by Antipholus of Ephesus (John Harrell). As Moss rambled on in a soliloquy about his lifetime of beatings—a speech totally lost amid the audience's non-stop laughter—Harrell was nothing short of balletic in his slo-mo rage-filled whipping, all while, to the side, Jeremy West as the Officer calmly ate a donut, also in slow motion. Scholars may cringe, but we'll take our Shakespeare with such gut-busting moments alongside Curns' and Fallons' majestic portrayals in iambic pentameter. I am certain, after seeing this production, that the original audience of drunken law students and Queen Elizabeth were equally pleased.